As soon as the first warm days of summer hit, the itch to spend more time outside takes hold. 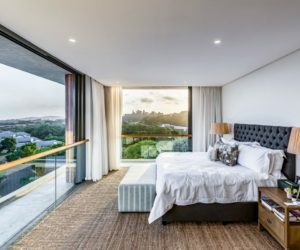 No matter whether you have a balcony, deck, yard or other outdoor space, designers have new designs to make it more stylish. 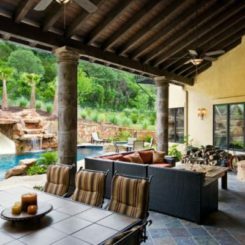 Current trends are turning outdoor living spaces into extensions of a home’s interior. Outdoor style used to mean lawn chairs and picnic tables, but those days are long gone. 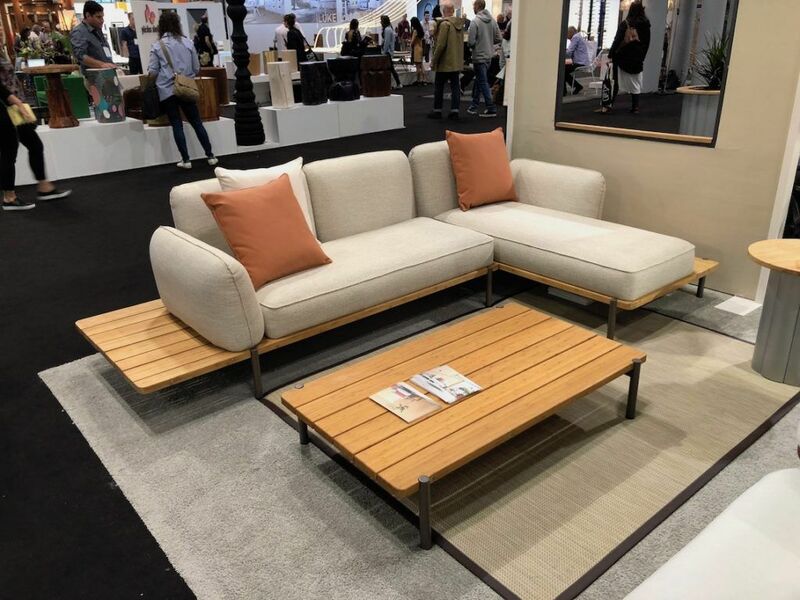 In fact, at ICFF 2018 designers and brands showed an increased offering of outdoor furniture in sleek, comfortable and attractive styles. 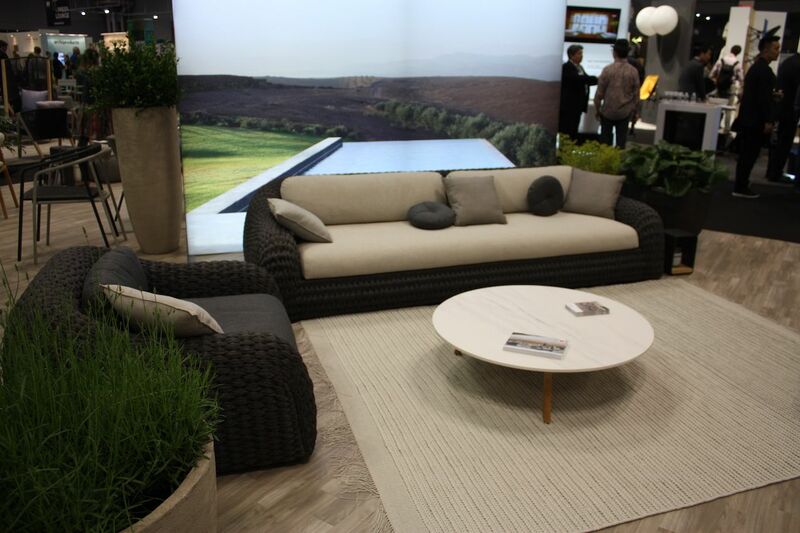 The daybed can be used indoors as well as outside. In a departure from his usual designs rendered in wood, Asa Pingree launched his new fiberglass collection. Drawing on his roots as a Maine boat builder, Pingree turned to fiberglass and expanded the functionality of the furniture. 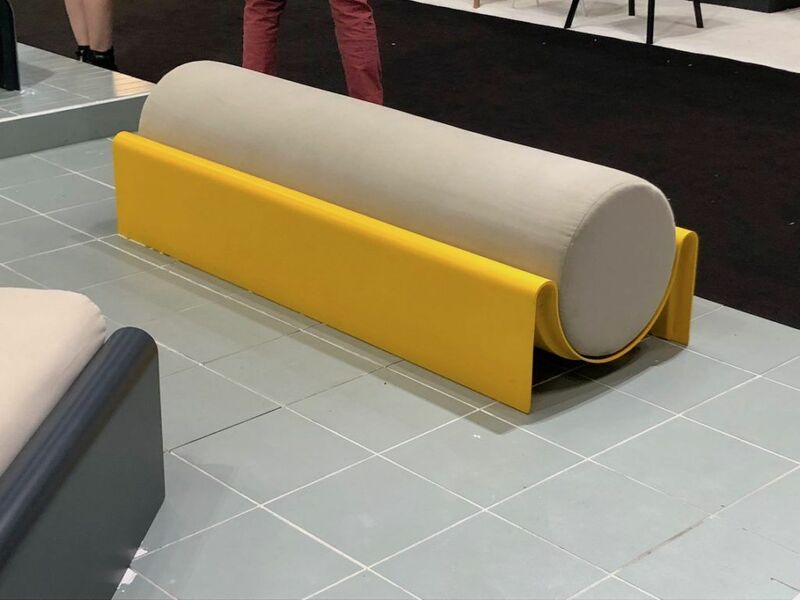 Working with the material is an involved process and Pingree used vacuum infusion which draws resin through the reinforcement fabrics using a powerful vacuum force. It allowed the designer to expose colored linens used on the surface of his daybed design. Like other fiberglass pieces, the Monitor Bench is lightweight and durable. Suitable for indoors as well as outdoors, the Magic Daybed has a minimalist silhouette and a removable cushion with a woven support underneath. The texture on the surface of the dark green bed frame is very interesting because the linen weave used adds extra dimension. 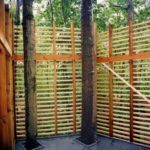 The material can stand up to weather and can be left out in the yard. 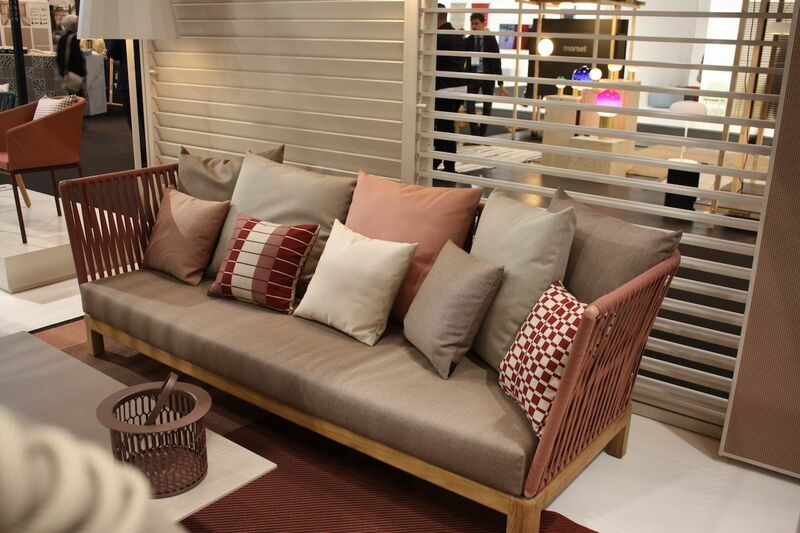 Long and lounge-worthy, this sofa is from Spanish furniture maker Calma. Created by industrial designer Andreu Carulla, the alat Collection is made from powder-coated aluminum. 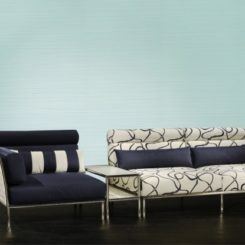 The cushions are upholstered in Silvertex vinyl fabric in white or black or Sunbrella Savane Zinc color. The sofa comes in two sizes. Thick and comfortable cushions angle upwards at the ends, providing not only a different look but an extra comfortable lounging style. The company’s designs are inspired by the sun, sea and art of the Empordà region. Pieces from the different collections mix well. 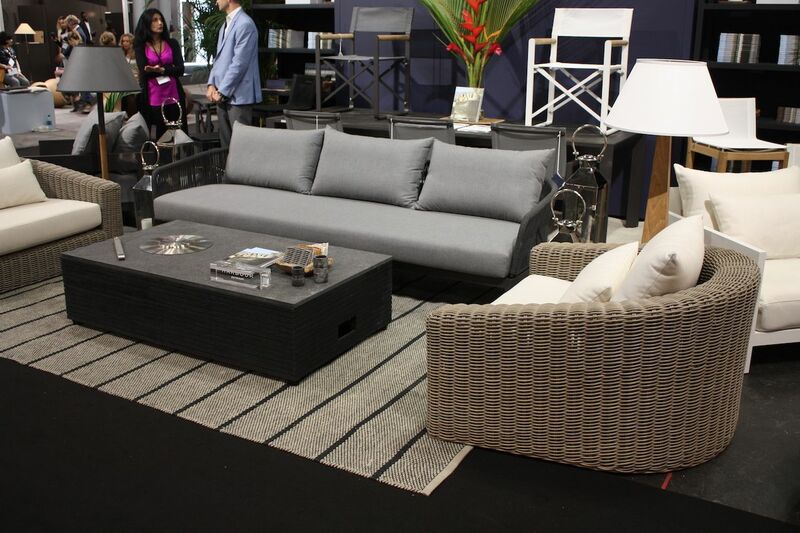 Nothing creates a more luxurious outdoor space than a coordinated seating area that resembles a living room. 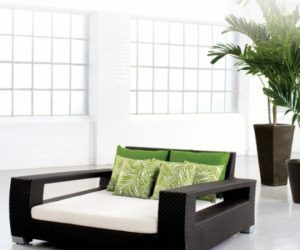 Harbour manufactures high-end outdoor furniture, like the pieces in this grouping. The Australian maker’s collections are built to withstand a variety of climates. 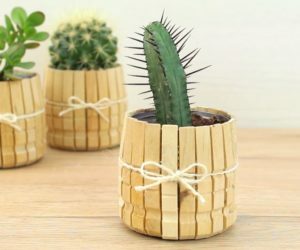 The pieces look like wicker but are actually an all-weather version that requires no special upkeep as regular wicker does. 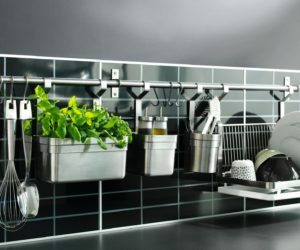 A stainless steel frame makes them extra sturdy and durable. Comfortable mildew-resistant cushions complete the furnishings. The Left Twist Cube is both sculpture and furniture. For a modern kick of color in an outdoor space, nothing beats the Left Twist Cube from Heller. Designed by renowned architect Frank Gehry, the colorful cubes are inspired by a giant sculpture that he created for a Paris event. 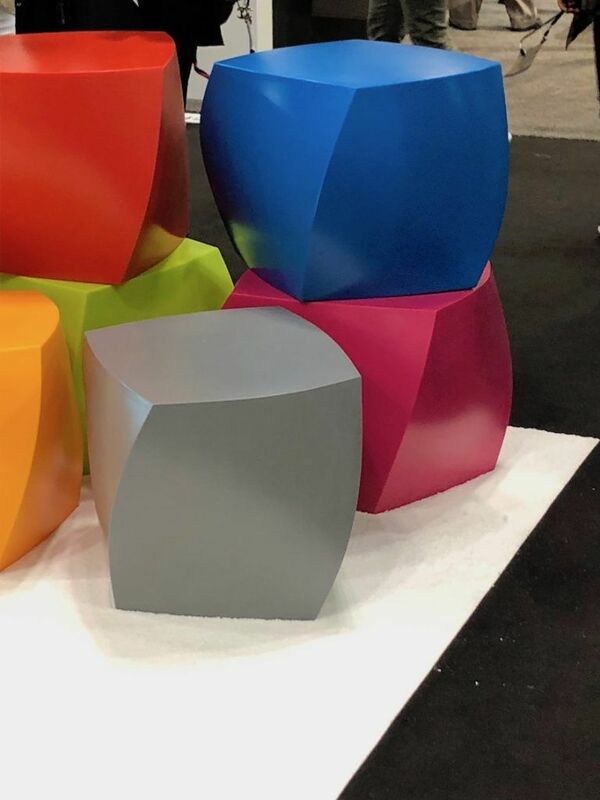 Originally silver and part of the company’s Frank Gehry Furniture Collection, the brightly hued cubes can be purchased in magenta, yellow, red, blue, green, black and white. 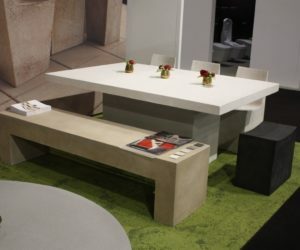 Made from a single piece of roto-molded polymer, the cubes are suitable indoors or out, as extra seating, side tables, plant stands — just about anything. The light and airy design has a thoroughly modern look. 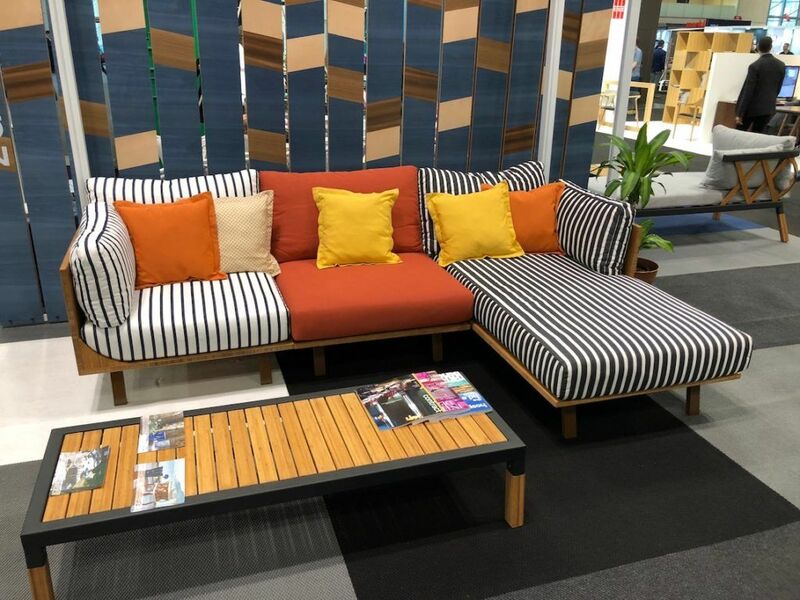 Versatile and totally modern, this modular sofa from the Lagarto collection is from ISI Mar. 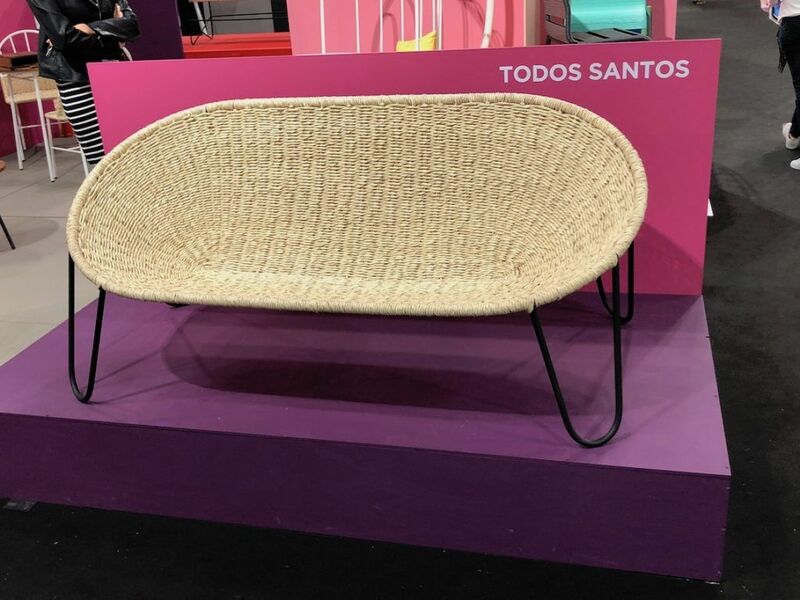 The Spanish company has been producing colorful furnishings for indoor and outdoor spaces since 1966. 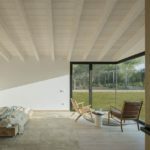 Manufactured entirely in Spain, the pieces are weather-resistant and made from materials like steel and aluminum that are recyclable and easily recycled. 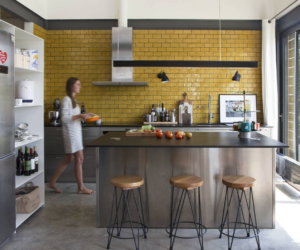 The Lagarto is made of powder-coated galvanized steel. 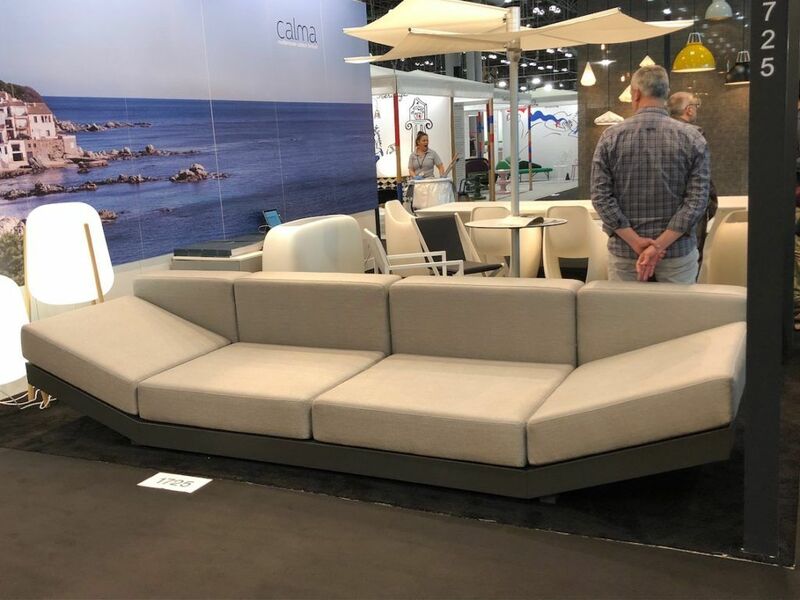 With its high back sections, it can easily be rearranged into a circular configuration making it cozier for conversation, especially in cooler or windier weather. Matching stools and armchairs are also part of the collection. 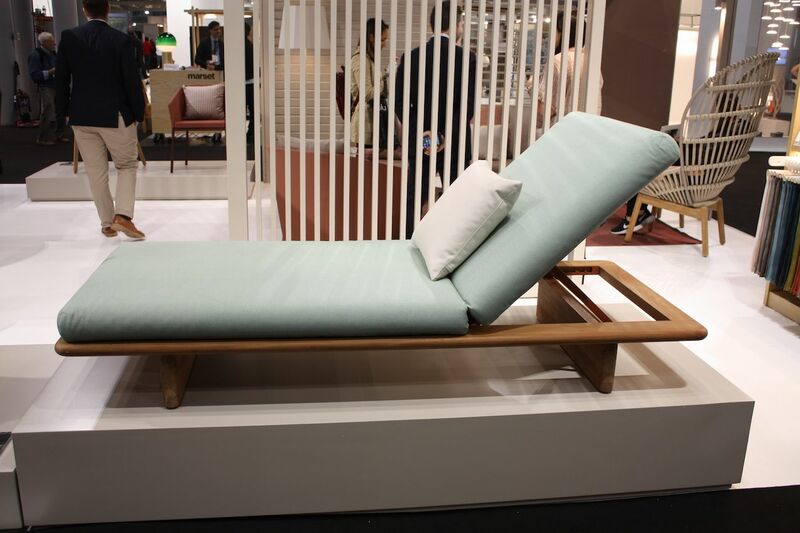 Large and comfy, the daybed accommodates one or more people. Jetty 14 works with a variety of brands that provide high-quality outdoor products. Founded by outdoor industry veteran Sean Smith, the company presents brands like Tonik, Egoe and Mamagreen. 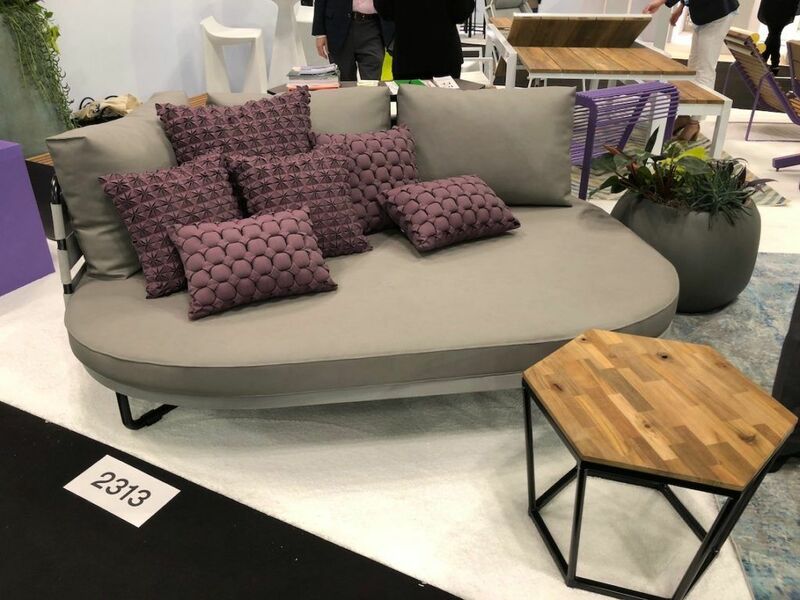 The Meika daybed comes in a ‘him and her’ set that face left or right and feature a marvelously comfortable rounded shape. Generous cushions in a neutral color are highlighted with texturally embellished pillows that provide extra style as well as comfort. 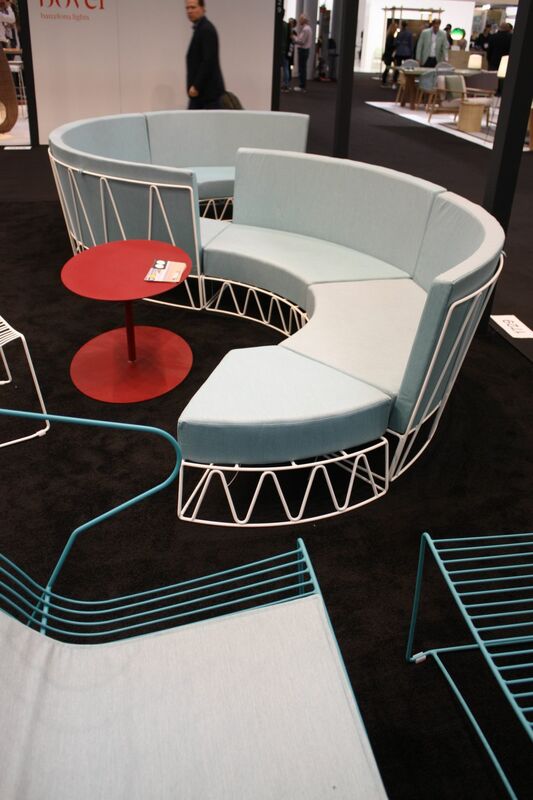 Designed by Vincent Cantaert and Barbara Widiningtias, the stainless steel frame is woven with Leisturetex®. These deck chairs come in different sizes and configurations. 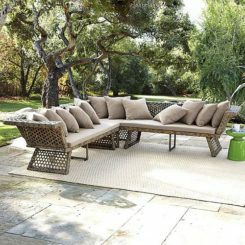 Kettal’s earthy and inviting designs make you want to lie down and lounge. The uber-stylish Spanish company Kettal collaborates with numerous international designers such as Patricia Urquiola, Ronan & Erwan Bouroullec and Jasper Morrison among others. 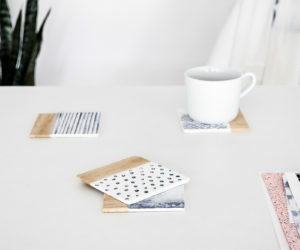 The pieces are made with eco-friendly paint, almost all of which are now 100% ecological and recyclable, and the wood is sustainability certified. The sunlounger deck chair above is from the Mesh Collection by Urquiola and is perfect for poolside sunbathing or backyard napping. 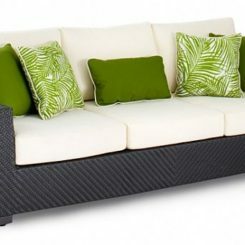 The sofa below is a great example of a versatile style that will instantly upgrade an outdoor living space. Mixed materials and a stylish design create extra interest outdoors. Puffy cushions sit atop a wooden base in a unique design. 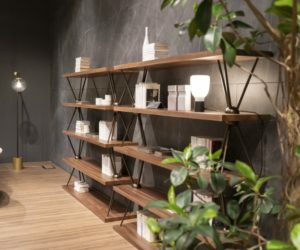 KUN, which has been producing stainless and aluminum furniture for over 15 years, has now added wood to their modern and attractive designs. 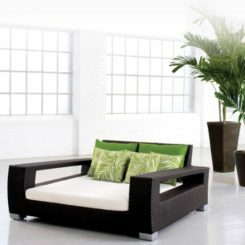 The Thai company’s furniture is ideal for defining an outdoor living space and providing comfortable seating. This set features their quality metal frame with a warm wood top, capped off with ample cushions that draw people in to have a set. 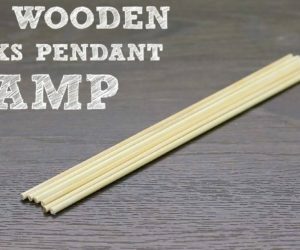 The wooden base also forms a ledge that serves as handy space for a glass, a plate or a lamp for nighttime relaxing or entertaining. 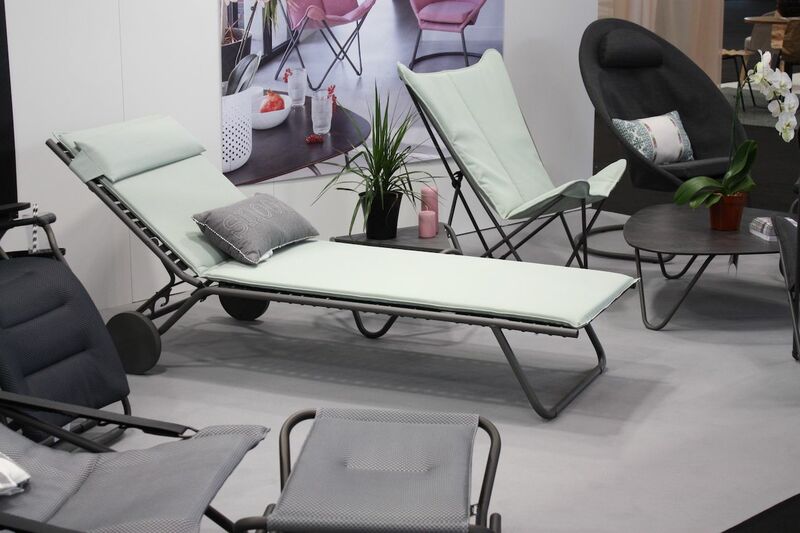 The elements of this lounger are easy to care for. Basic does not have to be boring and the Miami sunbed from Lafuma is a great example. The French company specializes in outdoor equipment and clothing and is known for its zero-gravity lounge chair. This Miami sunbed featuring performance fabric, a rust-resistant frame and two wheels that make it easy to move around. 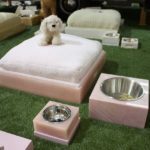 In addition, the bed’s construction uses elastomere clips to link the tubing and fabric, which gives it better back support. It also helps guarantee that the fabric does not lose its shape. Low and sophisticated, the new Kobo collection from Manutti almost looks like it was knitted into shape. The quiet, graceful curves of the back and arms give the sofa and the chair a very chic edge. 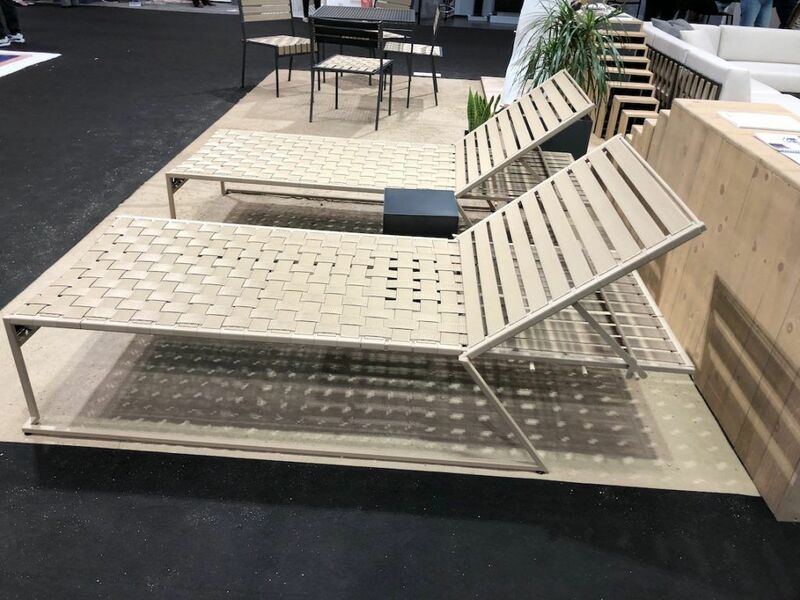 The Belgian company is known for its outdoor furniture that is very luxurious and has been used in many sophisticated residential and commercial designs. Using neutral tones in outdoor designs allows the landscape to be the star, whether that is the beach, the pool or an urban garden. 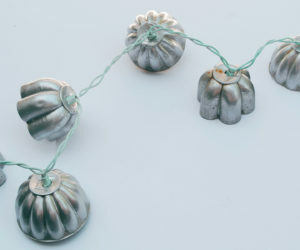 Casual and often colorful, Mexa’s hand-crafted designs are perfect for outdoor spaces that are easygoing and eclectic. The company makes all its pieces in Guadalajara, México. Marco Betancourt and Sofia Gascon, the architect-designer team that founded the company aim for their pieces to reference mid-century designs and the glamour of Acapulco in the 1950’s. The Todos Santos bench is stylish and versatile yet eminently casual. Kinder Modern’s pieces show that children can have great design. 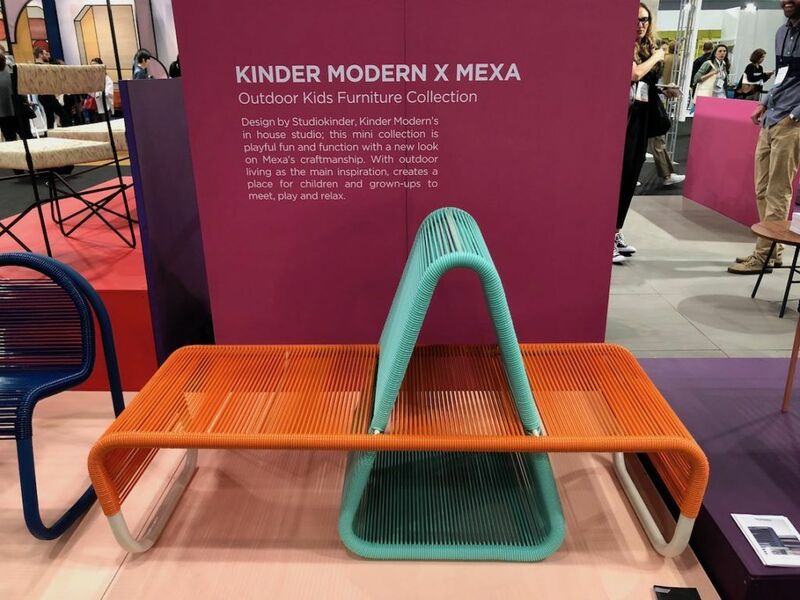 In a colorful collaboration with Kinder Modern, Mexa released a number of pieces that are child-friendly and comfortable, offering children as well as adults stylish space to relax. 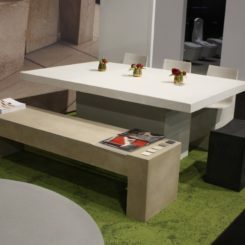 Scaled-down seats as well as designs like this unique bench. The two have previously collaborated on a pair of sold-out chairs as well as a pint-sized version of Mexa’s Ixtapa rocking chair. 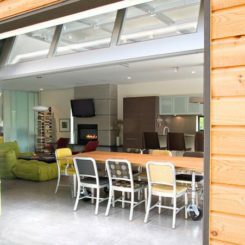 The frame is powder-coated and zinc-treated steel. 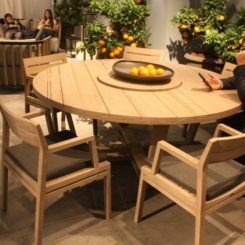 Los Angeles-based design studio Stephen Kenn recently has branched out into outdoor furniture with this Desert home collection, inspired by the landscape of southern California. 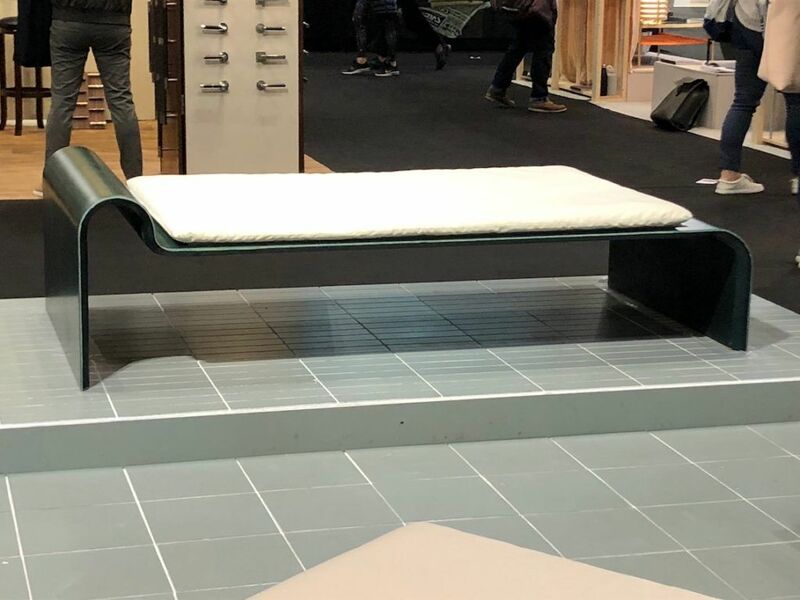 What may look like a standard webbed lounge chair is actually made of a special clip system that allows for the replacement of individual belts. Strong but springy, the belts create durable seating that lasts. The collection also includes sofas, armchairs and other pieces. An optional rain cover is available separately. Nothing is more appealing than a hanging nest where you can while away a sunny afternoon reading or napping. 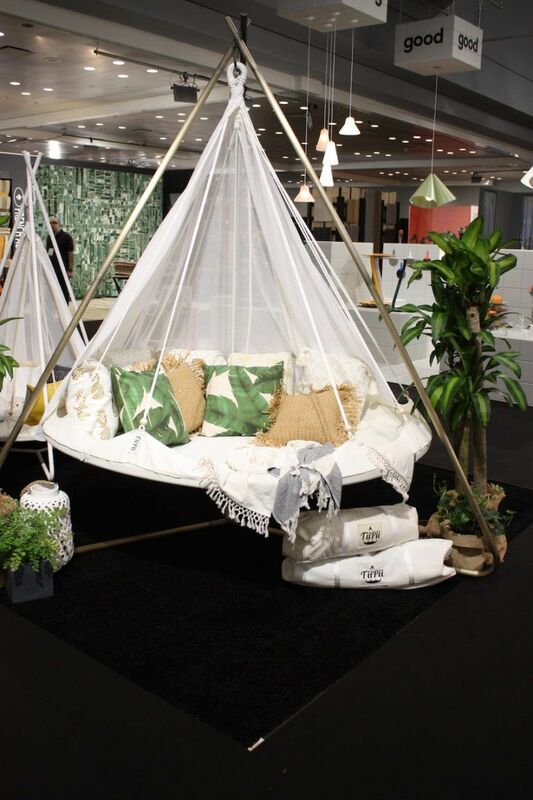 TiiPii offers indoor and outdoor versions of this comfy hanging bed. 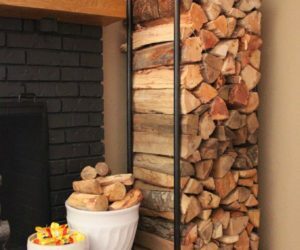 The Australian company launched in 2015 and offers large and medium sizes that can be hung from a structure or tree, or from a purchased frame. A smaller “Bambino” style is also available. 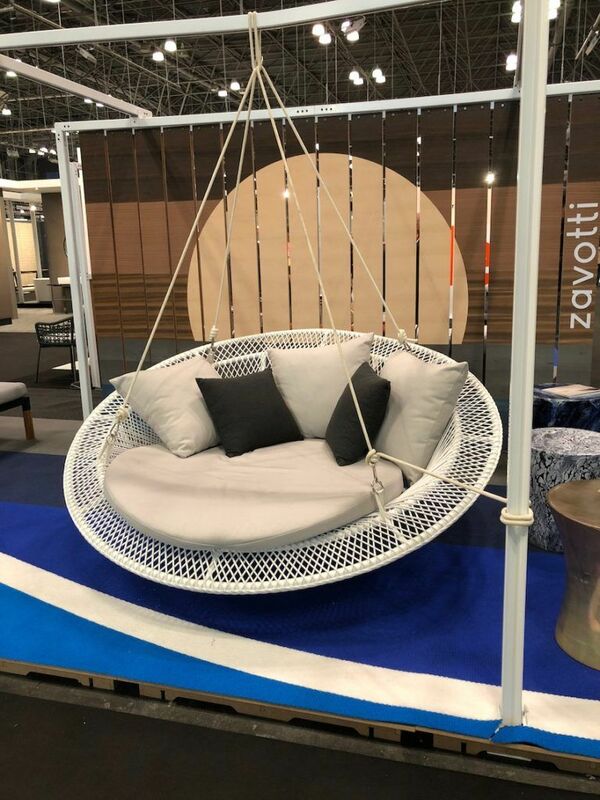 In a self-described melding of Mexican tradition and Scandinavian design, new brand Zavotti has developed a very attractive line of outdoor furnishings that are fresh and modern. 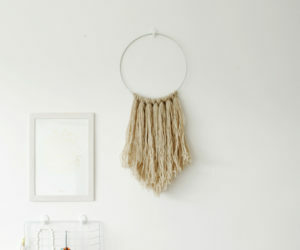 Among its offerings, this hanging seat is a standout. Created from lightweight aluminum and weatherproof nautical rope, the seat is sturdy and comfortable — and very light. Called the Lucia Swing, the name means first rays of sun and there’s no better place to wait for those than in this comfy seat. The wood frame complements the upholstery colors. The brand’s Soto dining table has been reimagined into a sleek and stylish coffee table. 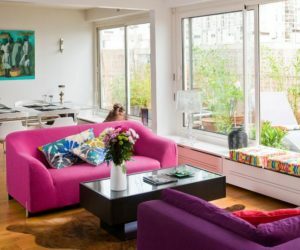 The design is sturdy and goes well with the sofa, which has a lounge extension. 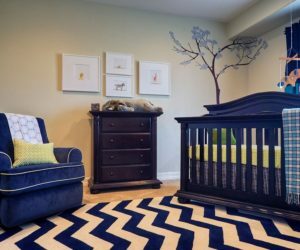 The bright colors in the upholstery, mixed with bold and varied stripes, create a modern look that is far more interesting than an orderly matched set. 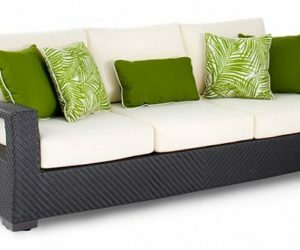 The choices for outdoor furniture are almost as varied as those for indoor spaces. 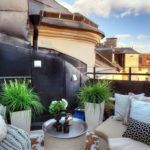 It has become much easier to create an outdoor living space that is comfortable and reflects individual personality. 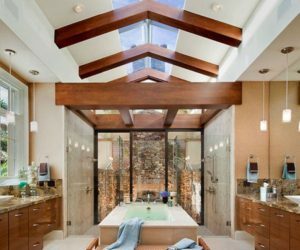 After considering the style and amount of space available for furnishings, the only other limits are personal desires and budget.